CloudRT makes it easy to add Cloud License to many OS and popular development environments with little programming. Add a runtime file to your project and call a few functions. CloudRT implements the Cloud License API by constructing, sending and receiving URL commands, storing and managing the license status and presenting a customized user interface based on the license type, status and developer selected options. An application can send commands to setup a license, present licensing options and check the status of a license. Each development environment interfaces with CloudRT in a somewhat unique way, but commands work the same to provide consistency and reduce programming effort. 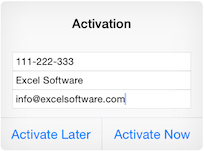 An Activation screen collects customer data and activates the application on a specific device. Once activated, the user can present a License Options screen to view or change license information based on setup parameters provided by the developer. CloudRT offers Trial, Product and Subscription licenses. A potential customer can enable a Trial to Product or Trial to Subscription license with their Email Address. Later the user can enter a purchased Serial Number to activate the full Product or Subscription license. PhoneGap developers can use PhoneGap CloudRT. CloudRT requires an Internet connection for initial activation. Once activated, an application can run without the Internet. See the CloudRT for Cloud License video to learn more.